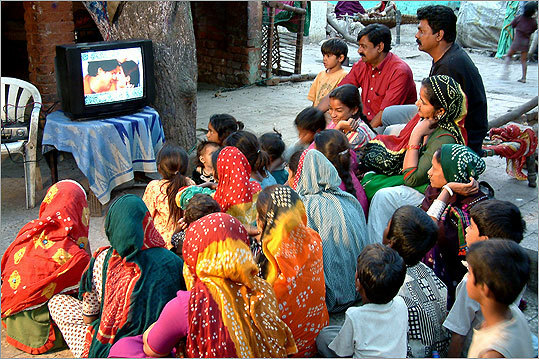 (Jaydeep Bhatt) A group of people watched television at a slum in Gulbai Tekra, an area in the city of Ahmedabad in India. These changes can be attributed partly to India’s recent economic liberalization, which has raised incomes and brought unprecedented growth across the country. But in Khodi, there’s another, more unlikely contributor: the soaring local literacy rate, courtesy of music videos. Every Sunday in villages across India, groups of people — an assortment of turbaned men, sari-clad women, and gap-toothed children — gather around old television sets to watch their favorite Bollywood film stars sing and dance in song videos culled from movies. These song shows, a popular component of mainstream television programming, are often the only way rural populations can see the stars or access the latest films. Nine years ago, India’s national television network decided to introduce karaoke-style subtitles to these programs — not in a foreign language, but in Hindi, the language the stars were singing in. The first state to broadcast the subtitles was Gujarat. People in Khodi, and in the rest of the state, saw the captions as an opportunity to sing along with the songs. They began paying attention to the moving strip of lyrics at the bottom of the screen. Often, they would copy the words on paper, going back to them after the show was over. And as they did, the reading level in Khodi slowly improved. According to Hema Jadvani, a researcher who has been studying the effects of the subtitles on Khodi, newspaper reading in the village has gone up by more than 50 percent in the last decade. Her research also shows that the village’s women, who can now read bus schedules themselves, are more mobile, and more children are opting to stay in school. In the fight against poverty, this is big news. Development organizations the world over have long been grappling with the challenge of increasing literacy, which is linked not only to economic growth, but to better health, greater gender equality, and a more transparent political process. Against this background, the apparent effectiveness of subtitles — along with their low cost, only 1 cent per person per year — has attracted the attention of academics and educators. Viewers in India have shown reading improvement after watching just eight hours of subtitled programming over six months; conventional literacy teaching methods typically require much more time and far greater resources to achieve the same results. Same-language subtitling extricates literacy from the tangles of school infrastructure and teacher availability. And since television, more than any other medium, has the power to reach out to billions across the developing world, it holds unique promise for hard-to-access groups like rural women, who are discouraged from venturing outside their villages once they hit puberty. The idea of SLS was born in 1996 at Cornell University. Brij Kothari, an Indian PhD student at Cornell, was learning Spanish for a research project. He’d been watching a lot of Spanish cinema but found that the English subtitles made it harder for him to “hear” the original dialogue. Kothari realized that if the films were subtitled in Spanish itself, he’d learn the language more easily. “Then it occurred to me that if all Indian television programming in Hindi was subtitled in Hindi, India would become literate faster,” says Kothari, who is now a professor at the Indian Institute of Management in Ahmedabad and founder of PlanetRead, an educational nonprofit. Five years later, Kothari managed to persuade the Indian state channel to subtitle its first batch of song shows, and since then he has campaigned tirelessly to popularize subtitling as a literacy tool. But even as far back as the early 1990s, there was some research support for the idea that television subtitles can improve reading skills. Finland, for example, a country that has repeatedly placed first on education rankings created by the Organization for Economic Cooperation and Development, has attributed much of its educational success to captions. For several decades now, Finland has chosen to subtitle its foreign language television programs (in Finnish) instead of dubbing over them. As a result, Finnish high school students read better than students from European countries that dub their TV programs. They are also more proficient at English. A Belgian psychologist named Gery d’Ydewalle looked at the effects of subtitling in a 1991 study. He found that reading of subtitles on a screen is almost involuntary. In other words, viewers find it nearly impossible to ignore subtitles, regardless of whether they can hear the sounds or understand the language. We’ve all experienced this — the inescapable pull of closed captioning when we’re watching a film, or find ourselves near a TV in a loud bar or an airport. Following d’Ydewalle’s findings, academics began researching the link between foreign-language subtitles and the ability to learn that language. What they found matched Finland’s experience with English shows — children and adults who watched television subtitled in a foreign language were likely to be able to pick up that language easily. As for same-language subtitles, research by Kothari and others has shown that viewers with low-level reading skills show considerable literacy and vocabulary improvement after watching subtitled television. Importantly, researchers found that the best results come from subtitling music. “Songs build phonemic awareness — the ability to break a word into syllables — more than dialogue,” says Clara Schmidt, an American educator who has independently evaluated the effect of Kothari’s system in India. Songs repeat lyrics, which gives viewers more time to make the sound-letter association. Viewers also often want to memorize the lyrics to a song, which motivates them to make an effort to read the subtitles — a factor that’s missing with ordinary dialogue. As helpful as subtitling appears to be, it isn’t a cure-all for literacy problems. One important shortcoming is that it can’t teach people to read from scratch: Viewers who can’t recognize letters aren’t likely to benefit from seeing subtitles scroll by. The method works best with what educators call early-literates: children and adults who have basic familiarity with the alphabet, but can’t read fluently enough to make productive use of their skill. Primary schools or basic reading classes are still needed to teach students that the letter “a” makes an “ah” sound. As its results suggest, however, SLS may hold promise in other arenas where readers are struggling to move beyond basic skills. Greg McCall, a special education teacher in Hawaii, created his own same-language subtitles to help his students, including learning-disabled students. McCall says he stumbled upon SLS while looking for ways to engage ninth-graders with difficult texts like “Les Miserables.” Instead of asking them to read the book, he showed them the musical and found that students were instantly more involved. Soon, he began adding subtitles and saw a marked improvement in reading ability. With traditional literacy software, says McCall, reading among his students improved by the equivalent of 0.7 classroom years in a year of teaching. Using SLS he saw a jump of two classroom years. McCall has been campaigning for his research to be discussed at a national level and suggests that it has applications across a wide spectrum of people: from children who are just beginning to learn how to read to teen dropouts to adults who never learned how to read fluidly. “America is not being honest about its literacy problem,” he says. Three out of five Americans in jail can’t read. Fifty million adult Americans can’t read beyond a fifth-grade level, leaving them at a semi-literate level that is often ignored in mainstream literacy campaigns. The solution, say educators like Schmidt and McCall, is to make closed-captioning compulsory for all children’s programming. “The government should also subtitle all MTV programs,” recommends Schmidt. But academics do warn against a potential pitfall: If subtitles become part of mainstream education, students may start to see them as “learning” rather than entertainment. For SLS to work, they argue, it must be seen primarily as fun, and it must stay out of schools. “My fear is that once it enters the classroom, it will become boring and turn people off,” says Stephen Krashen, an education researcher and professor emeritus at the University of Southern California. The problem of semi-literacy, of course, is a worldwide one — in India, for example, out of the 650 million officially literate people, only 300 million can read fluently. The low cost of SLS makes it easily replicable even in the poorest parts of the world. Gradually, says Kothari, governments and private organizations have begun to show interest in the idea. South Africa and Rwanda are considering implementing SLS on their state television channels. In Pakistan, a private television channel is talking about using same-language subtitles in Urdu on film song programs watched in Afghanistan and Pakistan. In the international educational landscape, where every small victory means spending hours negotiating with inefficient bureaucracies and a constant battle for funds, SLS is a rare bright spot. Using nothing more than a television set and a few songs, the method brings real literacy improvement and reading practice to people right in their living rooms. The simple system can inherently change the way we look at reading; it promises to exchange the tedium of the classroom for the entertainment of an hour of MTV. Riddhi Shah is completing her master’s degree in cultural reporting and criticism at the Arthur Carter Journalism Institute at New York University. She has written for Salon, Saveur, India Today, and the Hindustan Times.